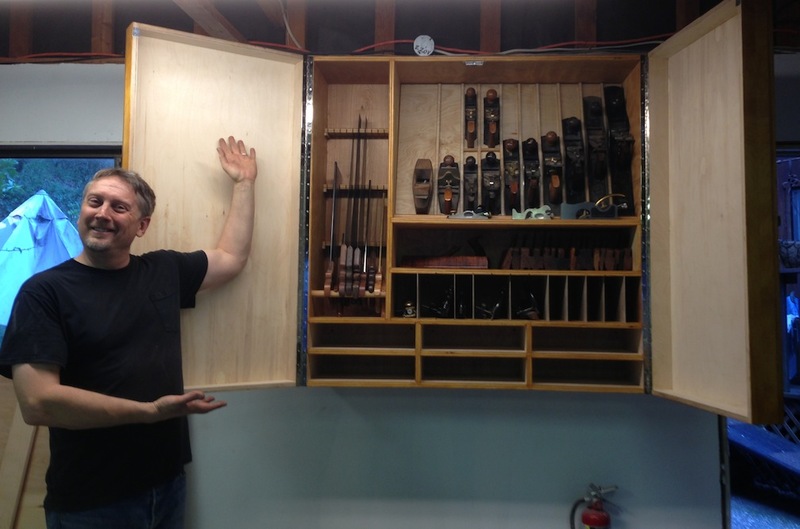 A while back I made a giant wall cabinet to hole my hand tools. It’s been a great addition to the shop and really reduced the clutter. 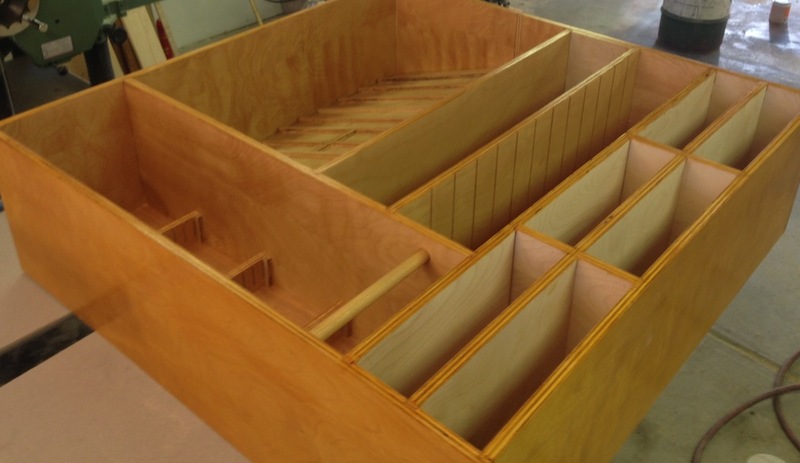 I designed in six little cubbies that I intended to fit with drawers. This past week I finally got around to making them. 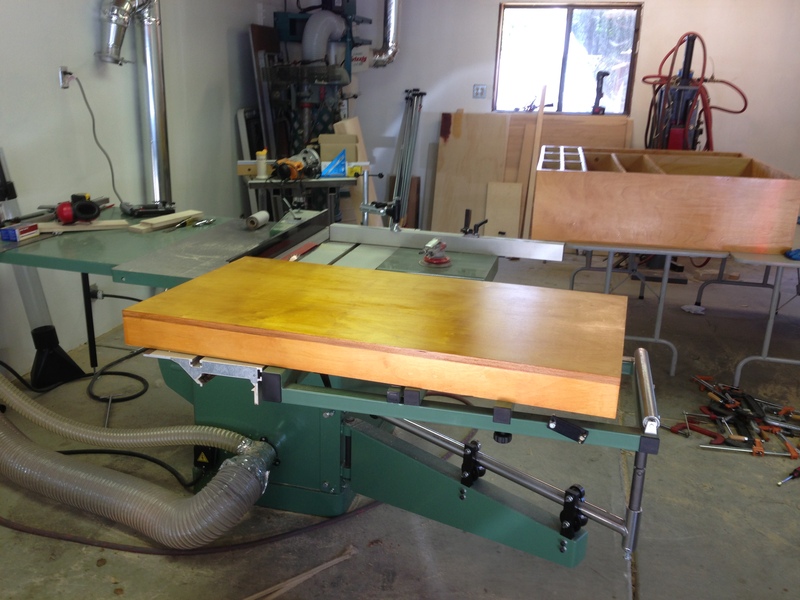 I’d originally intended to make the drawers using some simple joinery — either a drawer lock joint on the router table or some kind of dado and tongue using the table saw. I even bought a special bit for the router to make that joint, but in the end I decided to dovetail the drawers for practice instead. 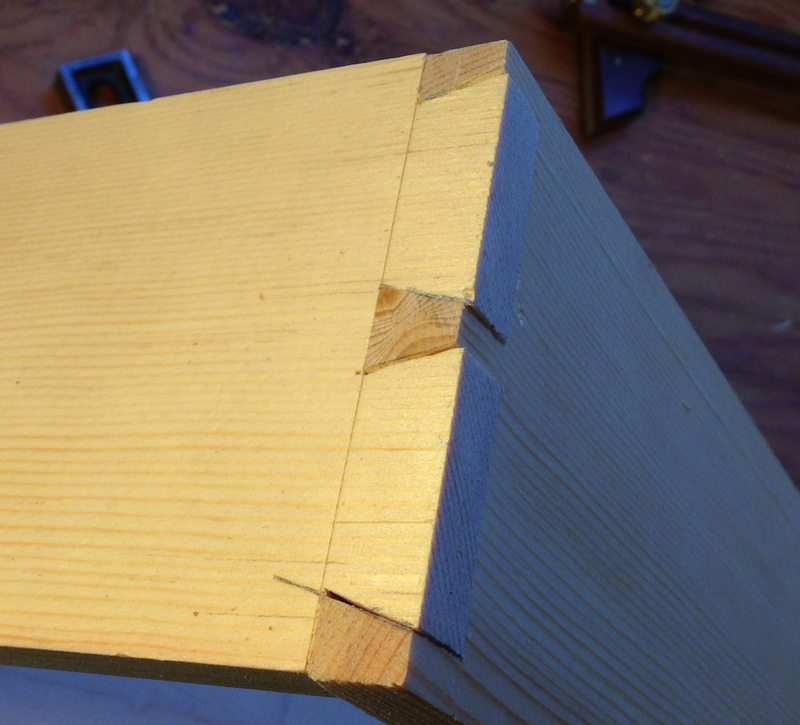 I’d only ever cut one or two half-blind joints previously, and that was in a class. I got out my tools, sharpened my chisels, milled up some lumber for the drawers and I was ready to go. On your mark, get ready, GO! 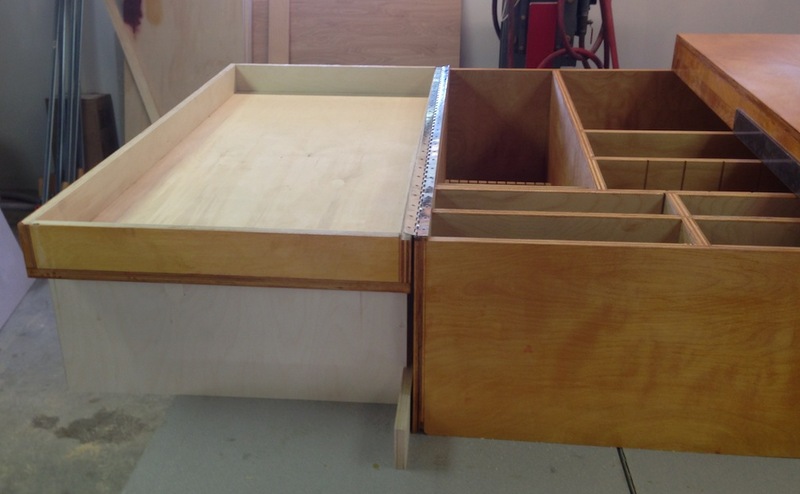 I used 3/4″ Alder for the fronts, 1/2″ pine for the sides and back, and 1/4″ plywood for the bottom. 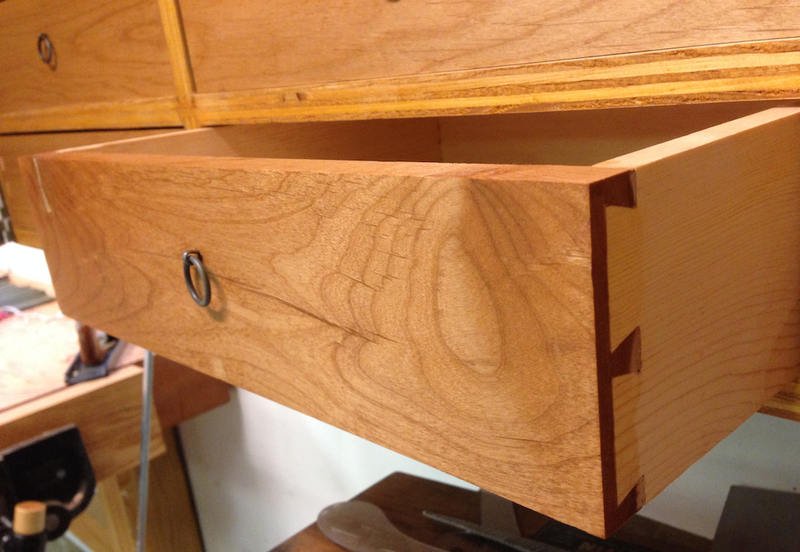 I worked really carefully and got a decent fit on both the half-blind and through dovetail joints on the first drawer. I was feeling good. I used the table saw to cut the grooves for the drawer bottom (my plow plane doesn’t have a “plywood thickness” cutter). I cut the grooves cut and started assembling…and discovered that I’d cut the grooves in the sides in the wrong place…at the top instead of at the bottom. Well friends, I was off to an inauspicious start. I thought about cutting additional grooves in the right place. I thought about starting over. I thought about how far I could probably throw the drawer. Then I flipped the two sides, side for side. Guess what? They fit. The fit wasn’t as good as it was in the proper orientation, there were a couple of gaps, but they were snug and plenty strong. Shrug. It I had a couple of other mishaps along the way. When I was paring out the back wall or one of the half-blind sockets on drawer number two it split off from the face. I wasn’t using much force, this Alder had a lot of shakes/splits. I think this is caused by improper drying. I glued the chunk back on and filled the crack with wood putty. It’s just a shop cabinet, after all. I gang cut all of the tails, which I picked up from seeing Christopher Schwarz on Roy Underhill’s The Woodwright’s Shop. 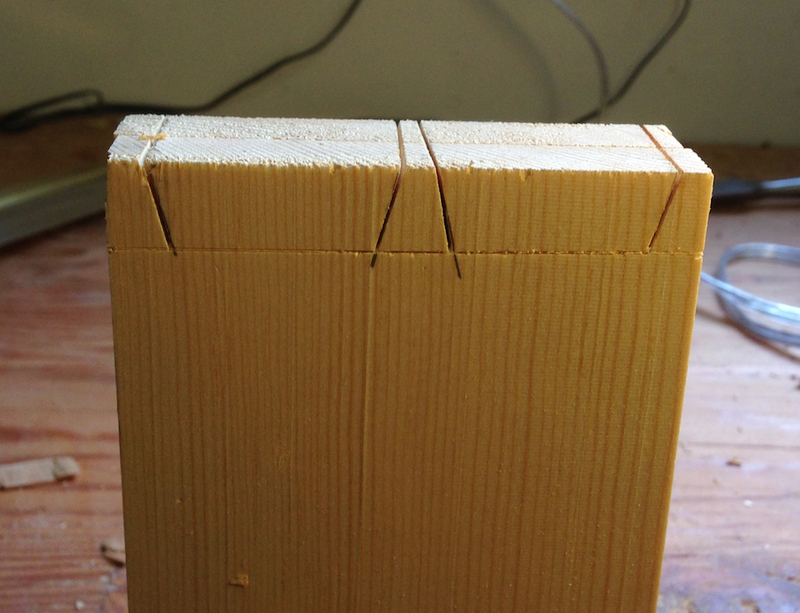 It made is simpler to get square cuts. 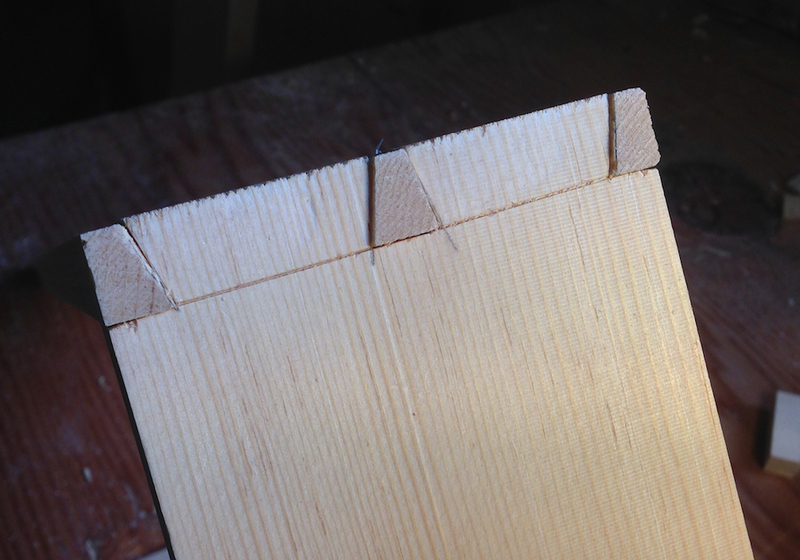 The let time I cut dovetails (pretty much every time I’ve ever cut dovetails, for that matter) the tail cuts aren’t square or consistent. You can’t get a proper fit if the sides of the tails are tapered. And it looks sloppy if the angle of the tail cuts isn’t at least somewhat consistent. I don’t know if it was the new workbench, or if my sawing has just improved, but I pretty much nailed every saw cut. Past attempts have involved a lot of trial and error fitting, paring dovetail faces and general futzing around to get them to fit together. I didn’t have that experience this time. I sawed to my layout marks, used a fretsaw to saw out the waste, and chopped directly on the baseline. I picked up a trick in a youtube video by David Barron on chopping the waste. If I had an 1/8″ or more waste remaining I chopped that away first. Then I dropped the chisel in the baseline, made sure is was square and gave it a couple of taps, then I leaned the chisel over two or three degrees — away from the baseline — and chopped to about the halfway point. Flip the board and repeat. I had nice tight fits at almost all of my baselines with this approach, where in the past (with a lot of screwing around being careful) I still had bruised baselines. In addition to using “cabinet maker’s triangles” to keep my drawer parts aligned, I also numbered the joints as a backup. 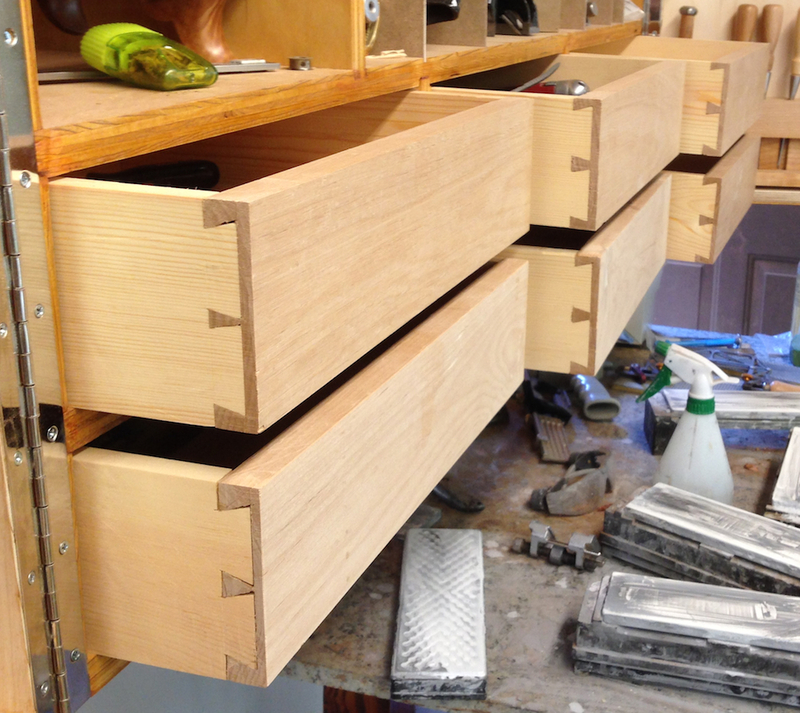 Except for mis-cutting the bottom grooves on the first drawer I didn’t mis-orient and parts. I’d intended to put some cheap knobs on the drawers and call it good. Then I realized there was no room for knobs. At the very least, they would interfere with the doors closing. Rats. I looked at some recessed ring pulls at the hardware store (and online), but at about $20 each that was too much cash for this project. 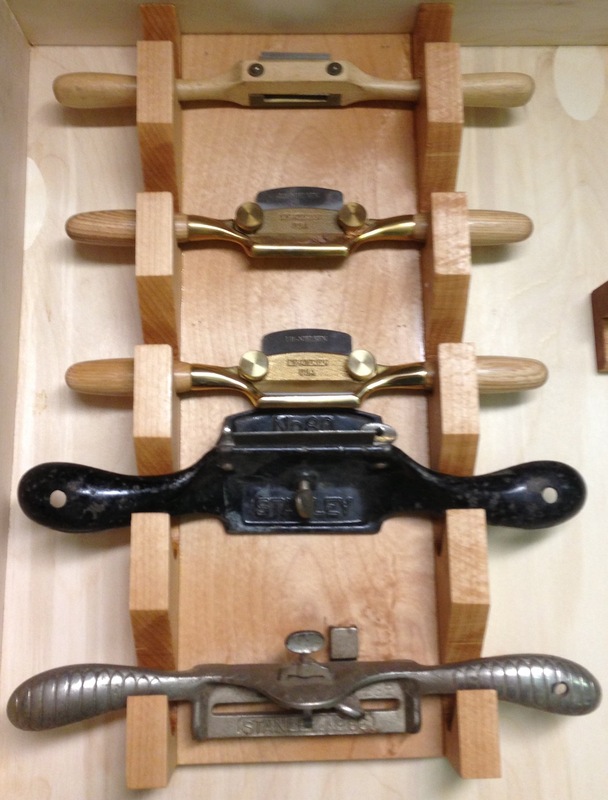 I thought about carving some recessed pulls. I saw this in Fine Woodworking. I did 3 or 4 practice pieces, but they took too much time and were too inconsistent. I wanted to get this done TODAY, thank you very much. So I ran down to the hardware store and poked around. 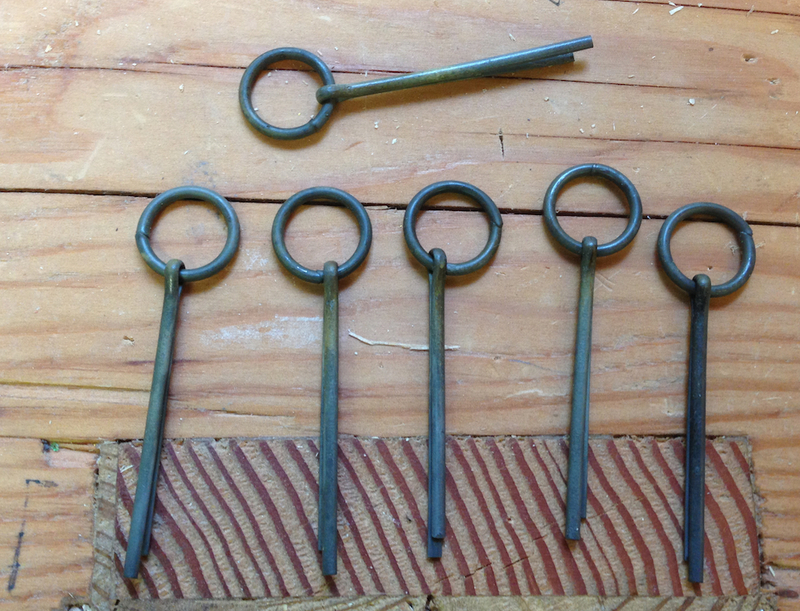 I picked up six cotter pins and six welded steel rings. For $7 total, with tax. And a bag. 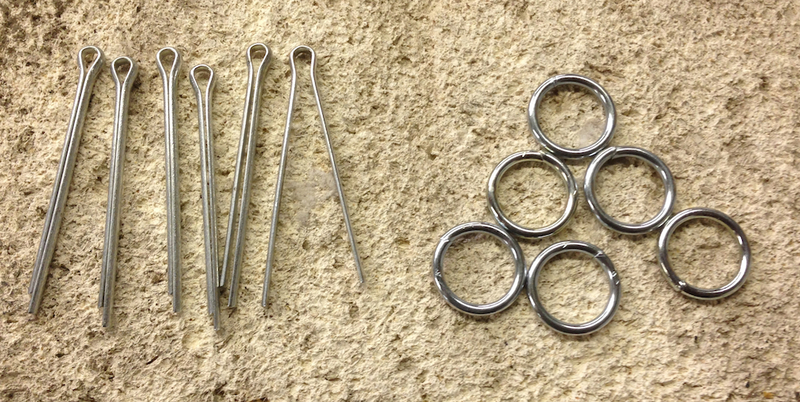 The rings are chromes, the cotter pins are since plated steel. They had brass cotter pins, but I didn’t want to make my own brass rings, that would be a more attractive option. But I had to do something to make this look better. So I heated and oil quenched the parts, two cycles on the cotter pins, and three cycles on the rings. Then a coat of wax and they were ready to install. 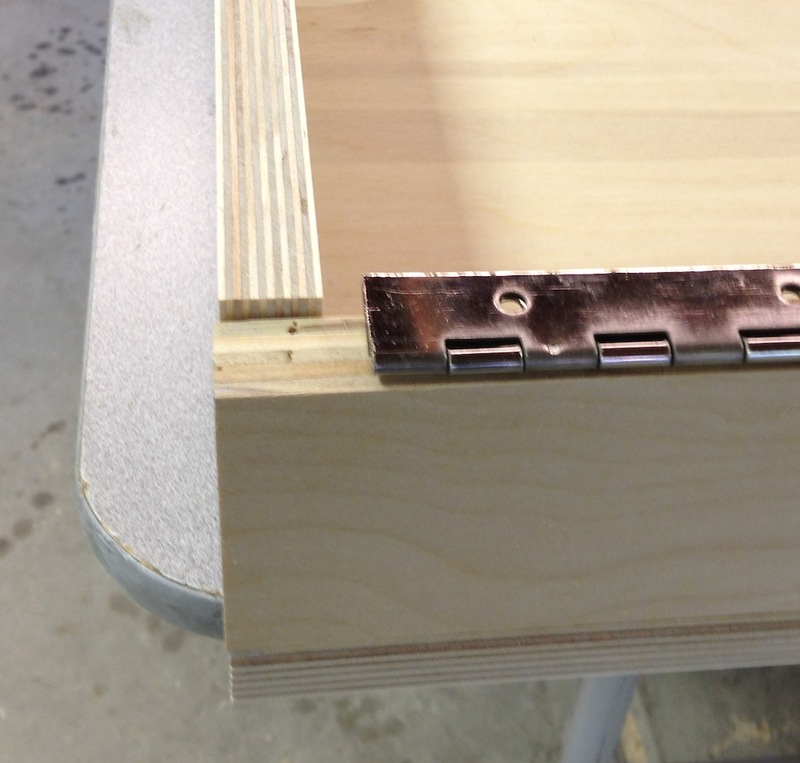 I drilled an 1/8″ hole, pushed the cotter pin in, spread the legs of the pin, bent the tips over and drove them into the inside of the drawer — just like clinching nails. It worked well. I rubbed in one coat of Tried & True Oil/Wax finish, and I was done. They pulls look good to me, they were cheap and easy, and the drawers are a wrap! Drawers prior to installing the pulls and finishing (the bottom drawer closest to the camera is the one I had to flip the sides, hence the gaps. Hell, I just happy it fit at all! 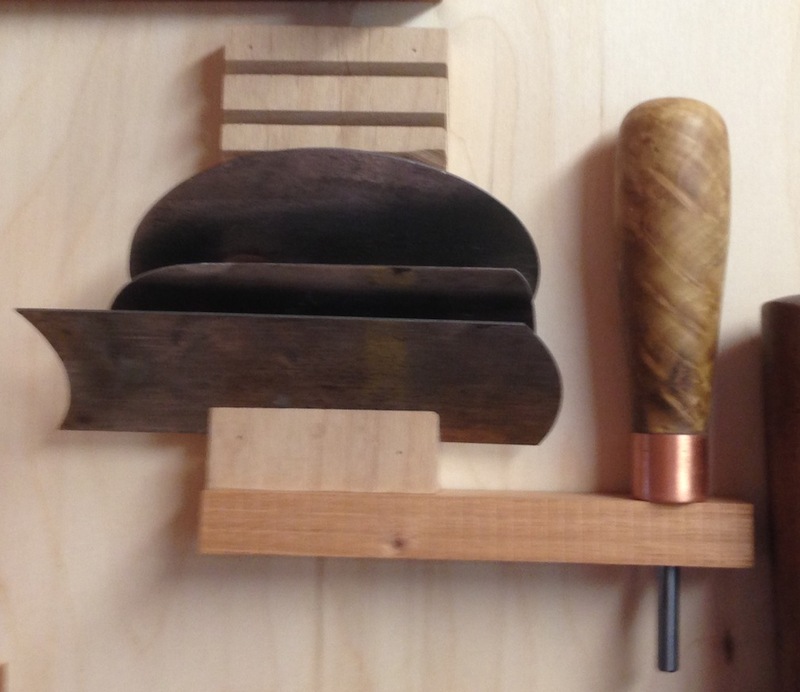 I managed to squeeze in a couple of more tool holders this weekend after the marquetry class on Saturday. We have too many activities going on this weekend to get much shop time logged, but I’m slowly chipping away at finishing the tool cabinet. Mostly this is simple stuff that doesn’t require a lot of planning or finessse. The spokeshave holder started as two 2.5″ wide strips of Alder that I tacked together. 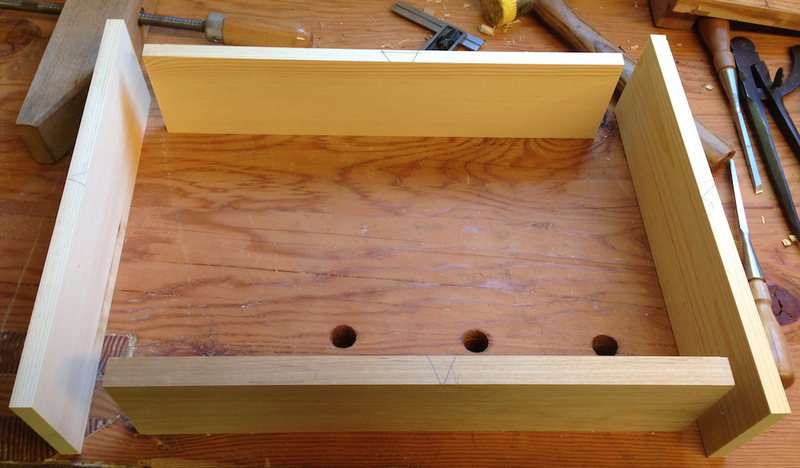 I spaced the slots 2″ apart and used a 1″ forstner bit to help lay everything out. Sawed out the waste, cleaned up the slots with a rasp, glued it to a spacer board and mounted it in the cabinet door after a quick coat of oil/wax finish. It’s not beautiful, but it’s functional…and done. Speaking of rasps, the rack for them is just a series of slots in another hunk of Alder. 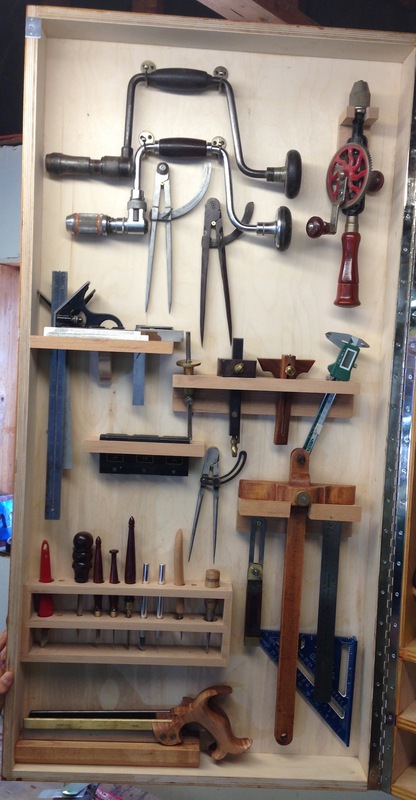 And that pretty much wraps up what I plan to store on the right side door of the tool cabinet. I’ll go over the inside of the door with a coat of finish this week. 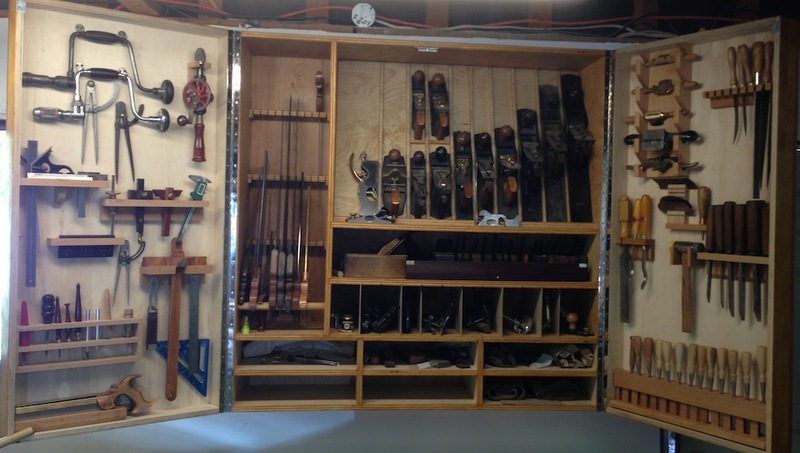 I’ll mount my bits and brace, and layout tools on the other door. I expect I’ll have room left over after that. I need to pick up some more Alder too, might as well be consistent in the wood that I’m using. In fact, I should use that for the drawers too I suppose. What to store in the rest of this door? 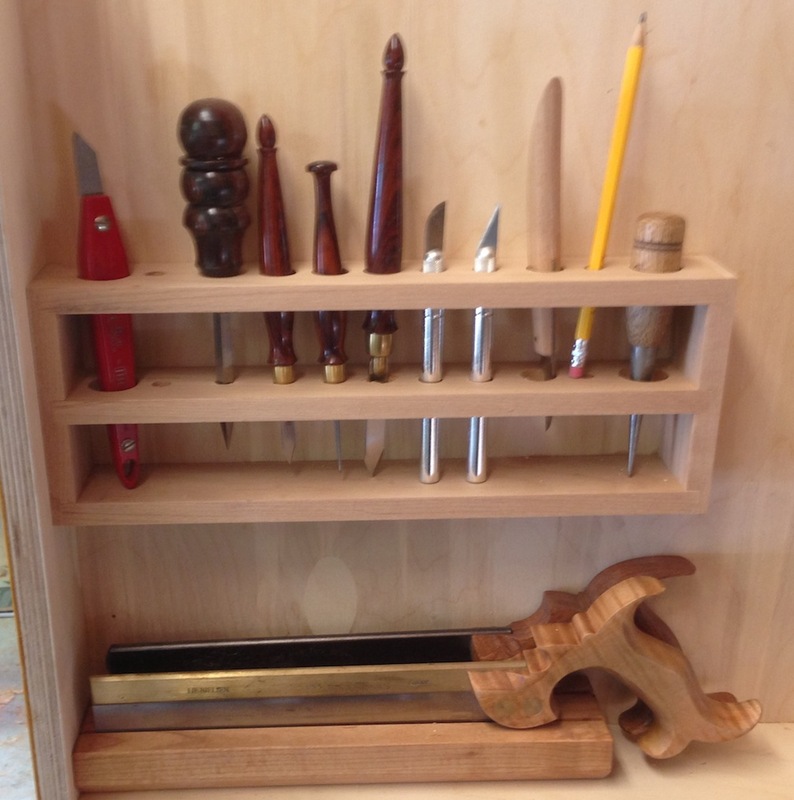 Yesterday I made holders for all my chisels, well most of them. I left out the carving chisels. I haven’t done enough carving to know much more than the pointy end makes owies in my hand if I’m not careful. I’ll keep those in a drawer until I develop some skills with them. I’m pretty pleased with what I have mounted on the right side door on my tool cabinet now. What should I do with the rest of the space on this door? 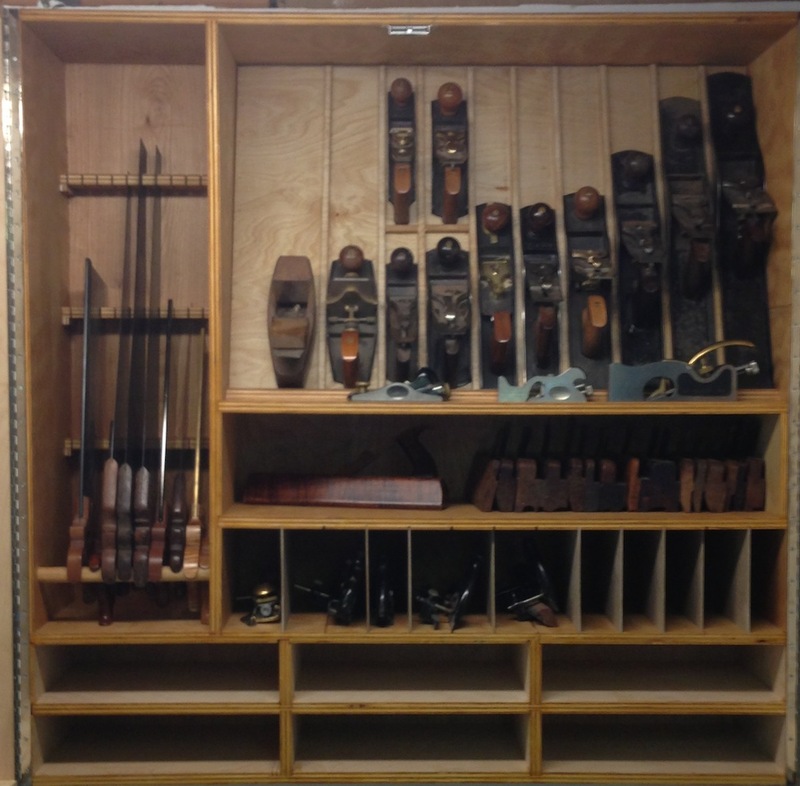 I’m thinking I’ll make one rack from my files and rasps, and another to hold my spokeshaves or scrapers — or maybe both will fit. That leaves the other door for my dovetail saws, layout tools and bits and brace. 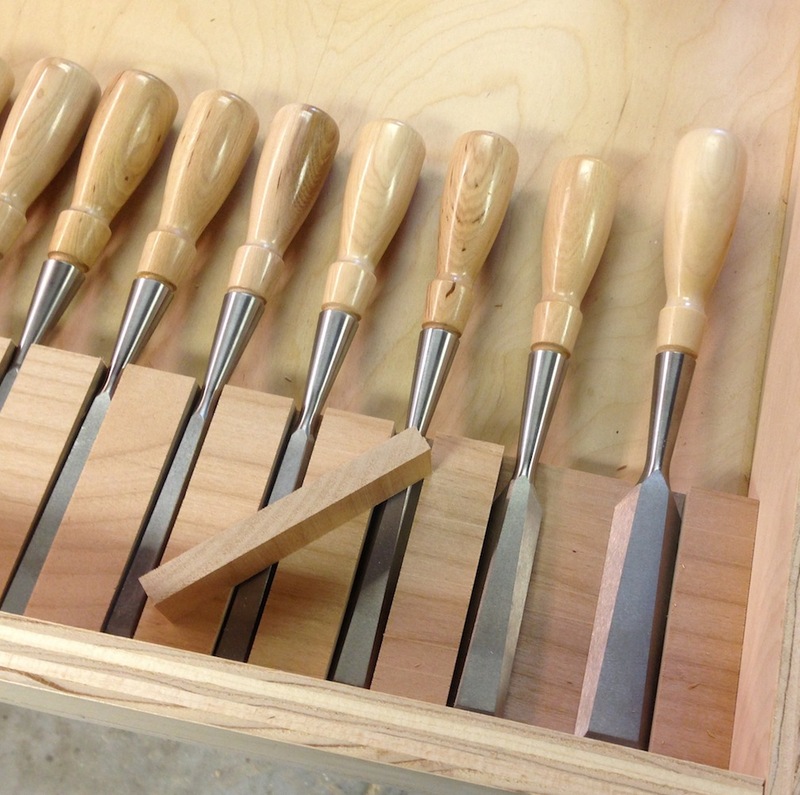 Chisels All Mounted – What’s Next? 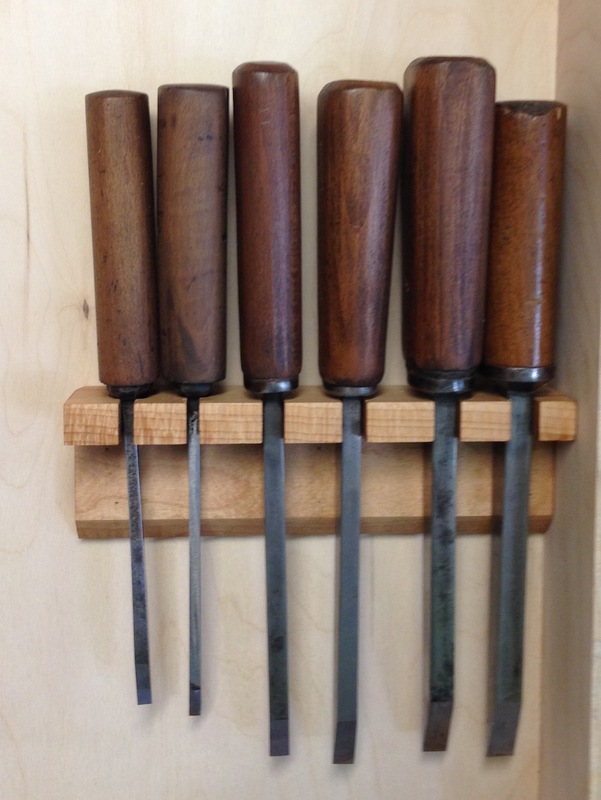 I’d intended to make a simple chisel rack. 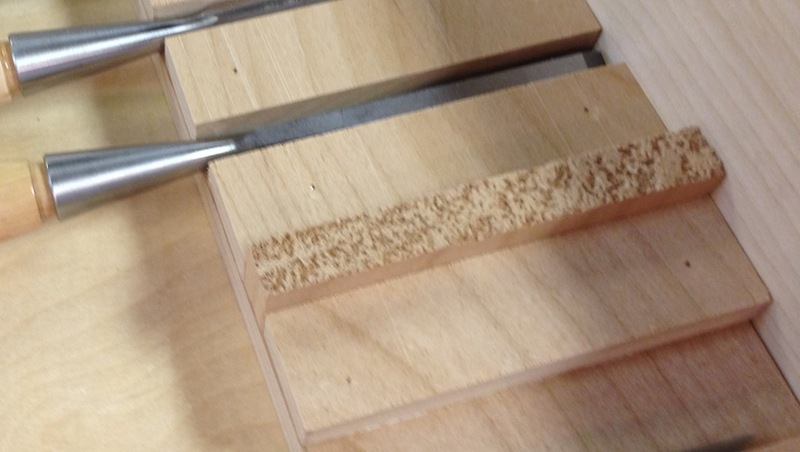 Just a series of holes drilled in a leftover hunk of plywood, with a slot to be able to slide the chisel in, then have it hang from the socket. I made some experimental pieces, but I just wasn’t happy with the fit. I googled for other ideas and found an article from Christopher Schwarz in 2003 that had a good idea, which I promptly stole. 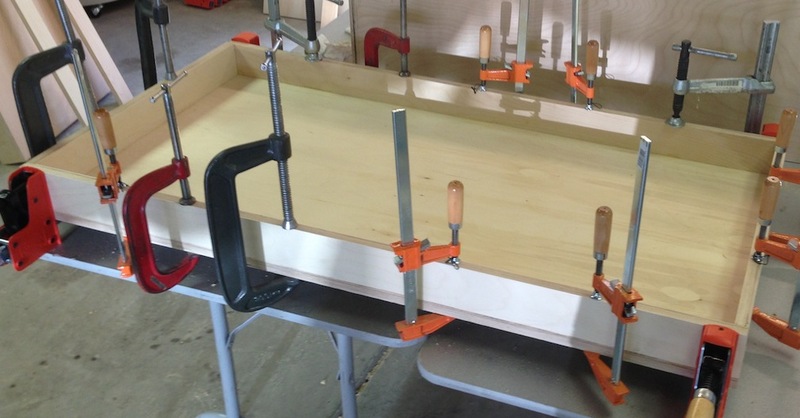 The jist of the idea, which you can read in all it’s glorious detail here, is to make a series of slots to contain the chisel by gluing spacers to a board and the adding a top board. The other nice idea was to have a cleat on the back. This lets me hang the rack on the inside of my tool cabinet door, or take it out and hang it somewhere else (like the back of my workbench). I made the base of it wide enough so that it can also stand on it’s own. I started by planing some Alder I had to .400″ — which was the slightly thicker than the thickest part of my biggest chisel that would need to fit in the rack. Then I cross-cut this into 1″ spacers. I glued and pinned one spacer at the end, laid in my largest chisel, sandwiched a scraper for clearance, and glued/pinned the next spacer in place. Lather, rinse, repeat. 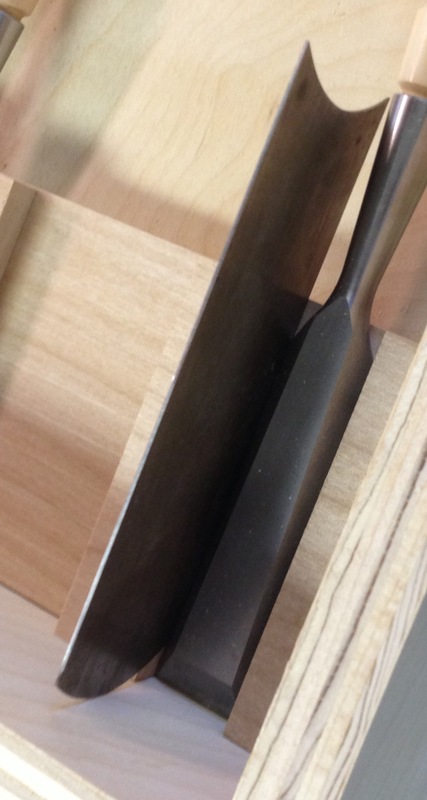 After the 1/2″ wide chisel, I made all of the slots the same width — .400″ — using an off cut from my spacer material. After all the spacers were glued in place, I glued on a front strip. The front and back pieces are both 1/2″ thick, so the sandwich is about 1.5″ thick at this point. Not counting the clamping cauls of course. Then I glued half of a French cleat onto the back, and a 3″ wide foot onto the bottom. I slathered it with a coat of oil/wax mix and put my chisels in it. 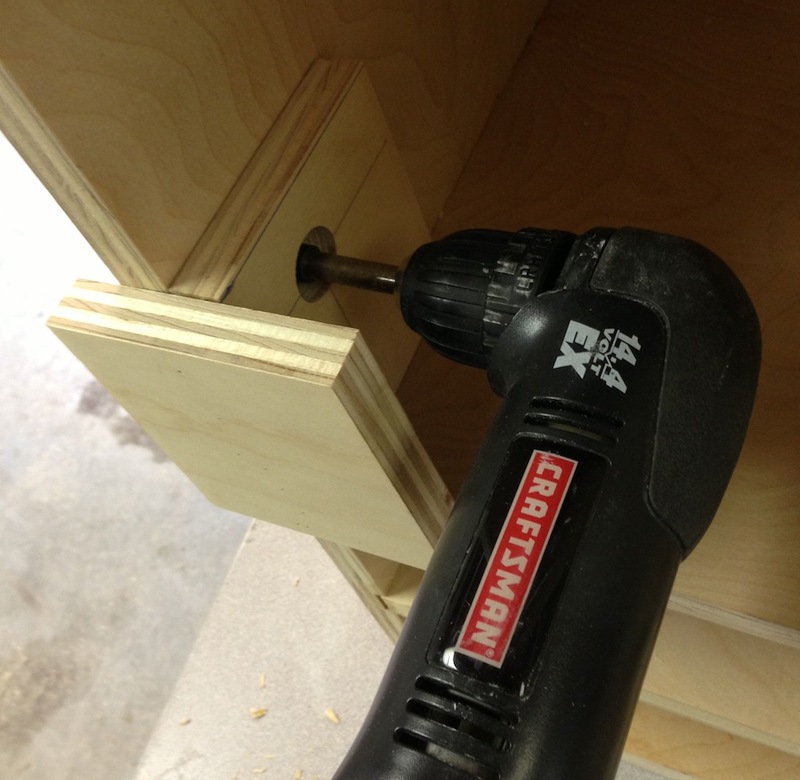 I glued the other half of the French cleat to the inside of my tool cabinet door. And hung the chisel rack on the door. 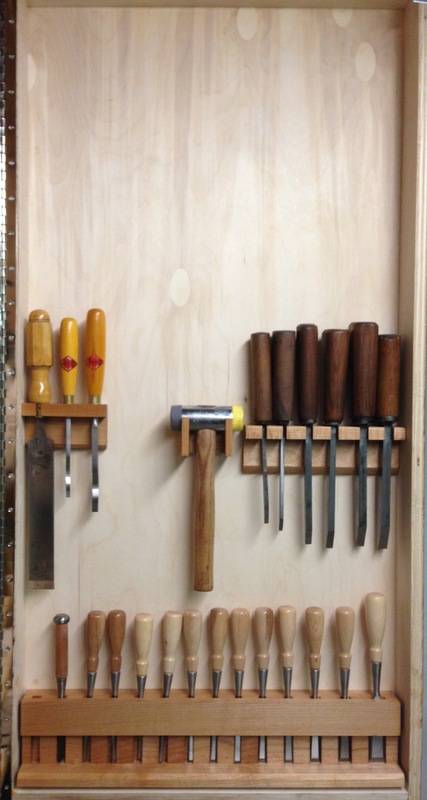 I made a much simpler, non-removable rack for my mortise chisels. 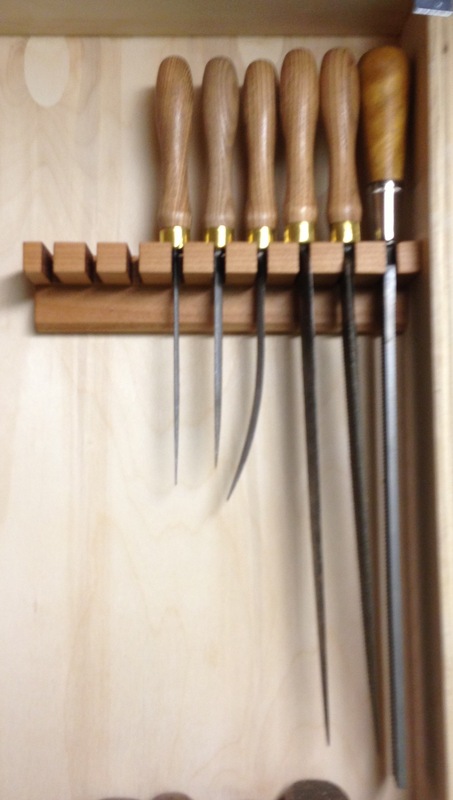 And another simple rack for my paring chisel and lock mortise chisels. 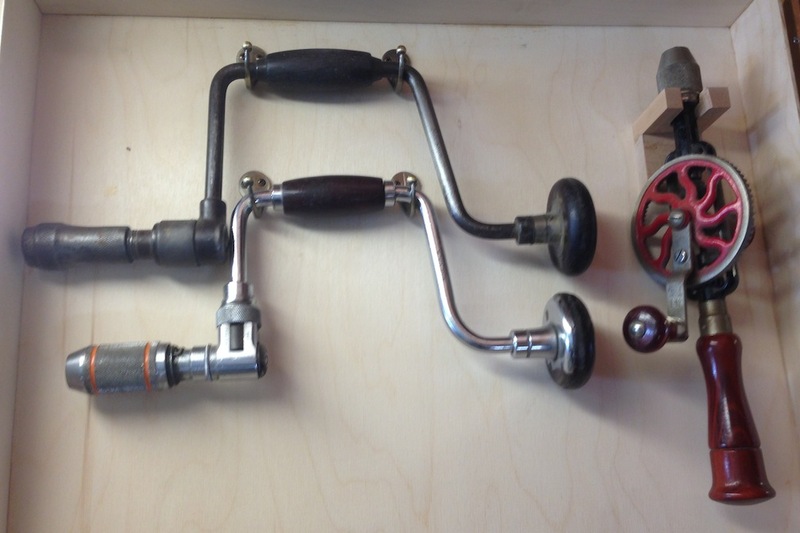 I have a hammer hanger drying in in clamps now, and that will finish off my chisel area. 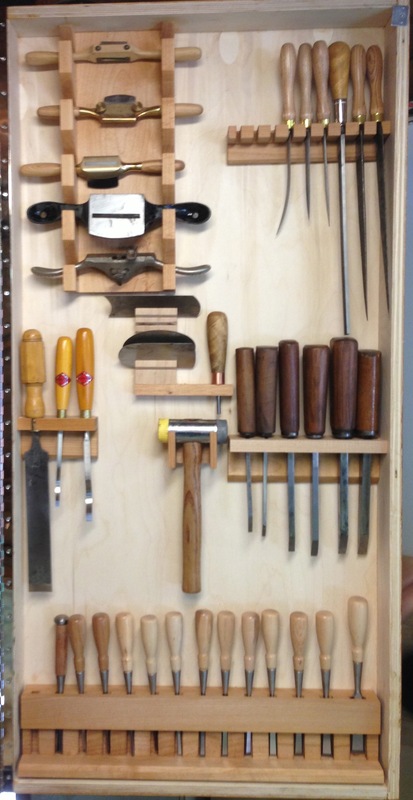 I need to do the same for my small saws, drills and layout tools. Then I need to make the drawers for the cabinet and it will be well and truly completed. 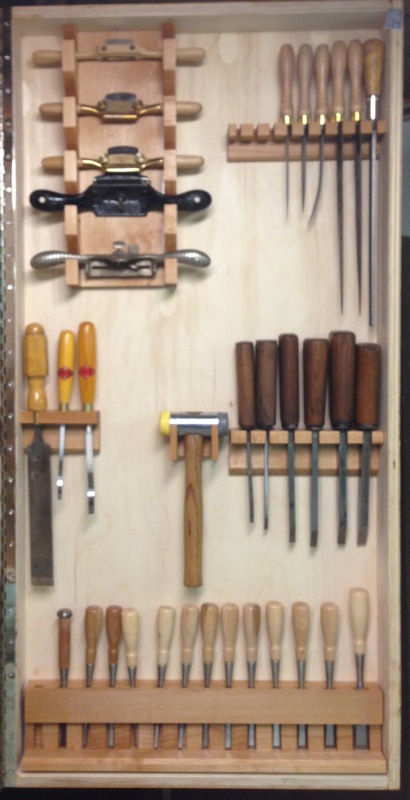 I just got the tool cabinet up on the wall, it took my wife, my son and met all together to lift it up high enough. But I’m getting ahead of the story. 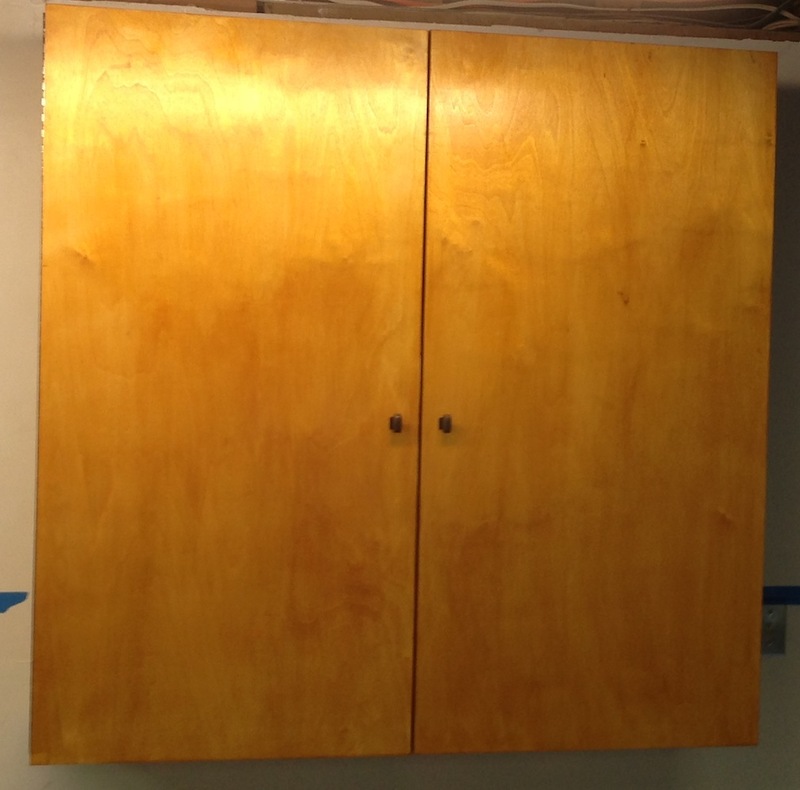 I sanded the outside of the cabinet with 220 then brushed on three coats of amber shellac. It’s not fancy, but it will give it a bit of protection from dirt. 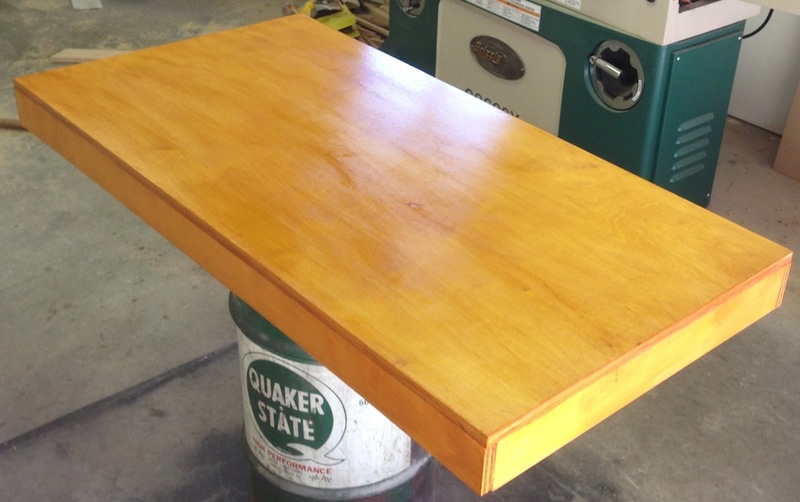 By the time I’d done three coats on all the exterior surfaces I was pretty comfortable with brushing shellac. I also slathered the inside of the cabinet with a coat of Tried & True Oil/Wax finish, except for where the drawers will go. Then I had to hang the doors. I made some little stands to hold them at exactly the right height, which made getting the hinges on a piece of cake. The #4 screws that came with the piano hinges were pretty short (1/2″) so I picked up some longer 1″ screws. 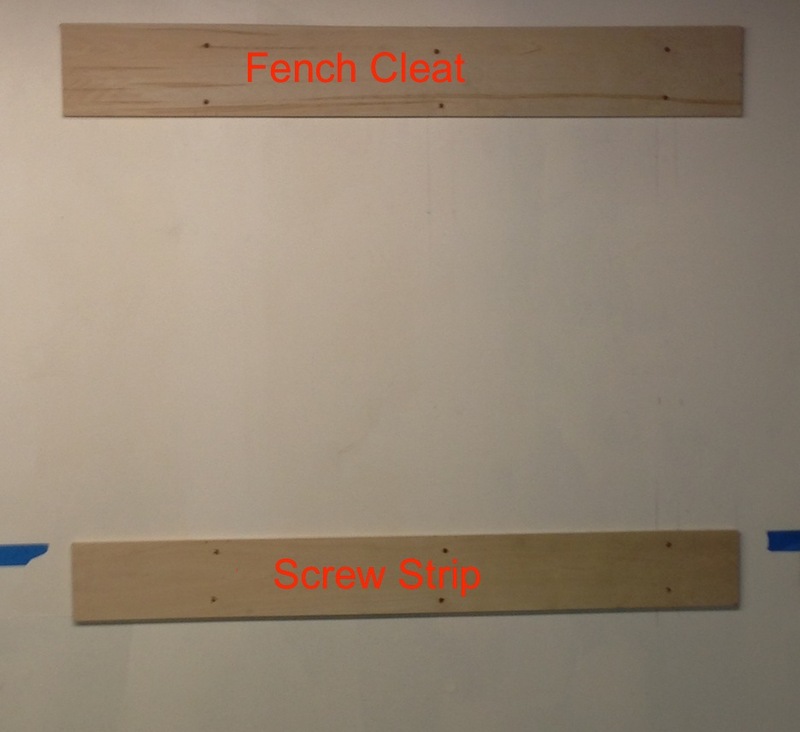 Then I screwed the french cleat to the wall, I drove 3″ deck screws into 3 studs that I was able to span. Below that I have another strip of plywood that I’ll screw into through the back of the cabinet (behind the drawers) to help support the weight. No ominous creaking sounds. I drove in the support screws and started loading in tools. I still need to make the drawers and hang tools on the inside of the doors. I’ll work on that this week. It feels pretty good to have this much finished. Something about the perspective in this picture make the cabinet look smaller than it is. It’s big, and heavy. It’s about 48″ square by almost 18″ deep with the doors. So, it’s taking a little longer than I’d hoped to make the doors for the tool cabinet, about two hours to cut all the parts, lay out the locations for the biscuits and cut the slots, test fit and finally glue it up. Honestly, I think the glue up took the most time. I used the large (#20) biscuits veery 8″ all the way around the perimeter to align and support the edge strips. I also use the smaller (#10) at the four corners between the edge strips. 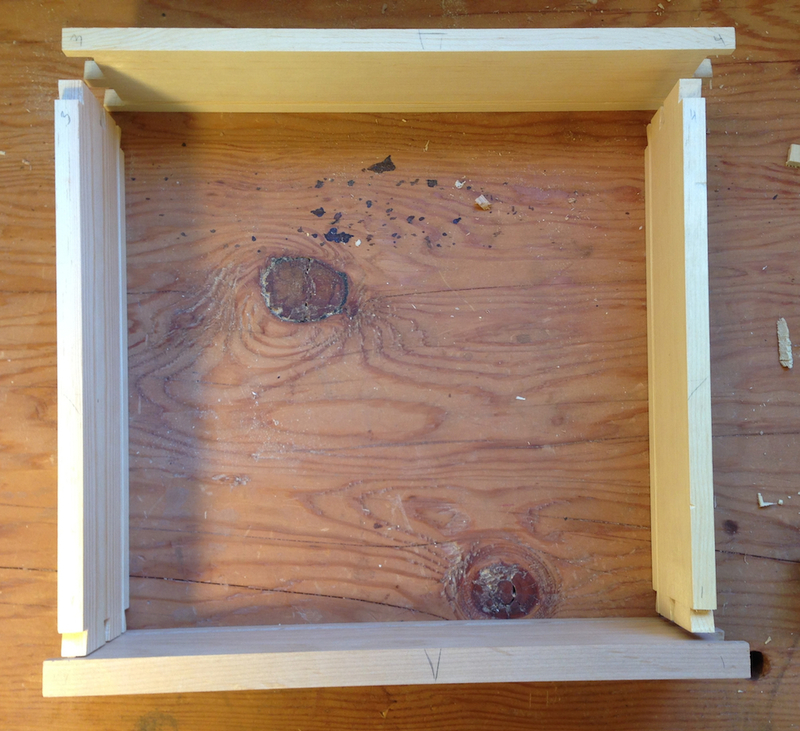 I should have taken a picture of all the slots, but I was in a hurry to get this done, and let’s face it…it’s not what I’d call “fine woodworking”, it’s just utilitarian. Thinking ahead (just a novelty, I won’t make a habit of it) I cut one of the long edge pieces .175″ narrower to allow for the piano hinge. The glue up was a pain. I put glue in the slots then used an acid brush to work it in (and get the excess out) way kind of fussy…and time consuming with 36 slots to work glue into. After I got this done I remembered that I bought a special biscuit slot glue bottle years ago (and never used it). I dug though my junk and found it. Maybe the second door will go a little more quickly. Anyway, it’s “in the clamps” and I have to go run a few errands. I’ll get the other door knocked out this afternoon for sure. I picked up some more plywood tonight to make the doors for the cabinet. I’ve been buying “shop grade” birch ply, which, frankly, is junk. Lots of voids and it seems less stiff than I would have expected. 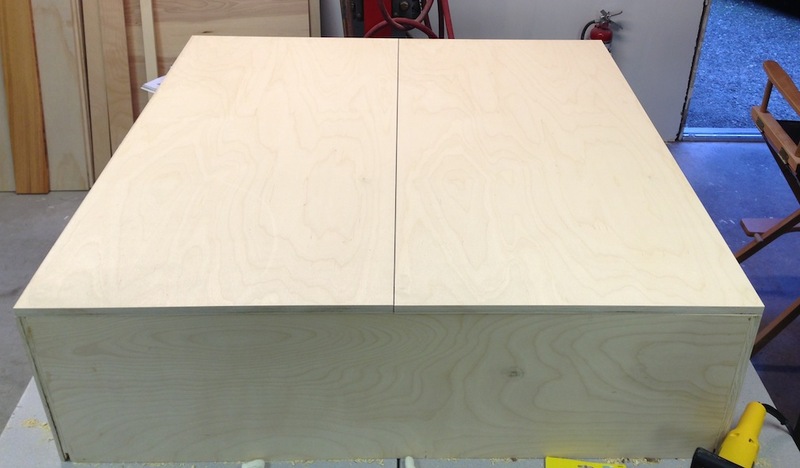 I got a 5′ x 5′ sheet of real baltic birch ply today, for about the same cost as the 4′ x 8′ sheets of shop ply. It seems like it’s much nicer stuff. More plus, no voids so far. I got my son to help me cut this up carefully. 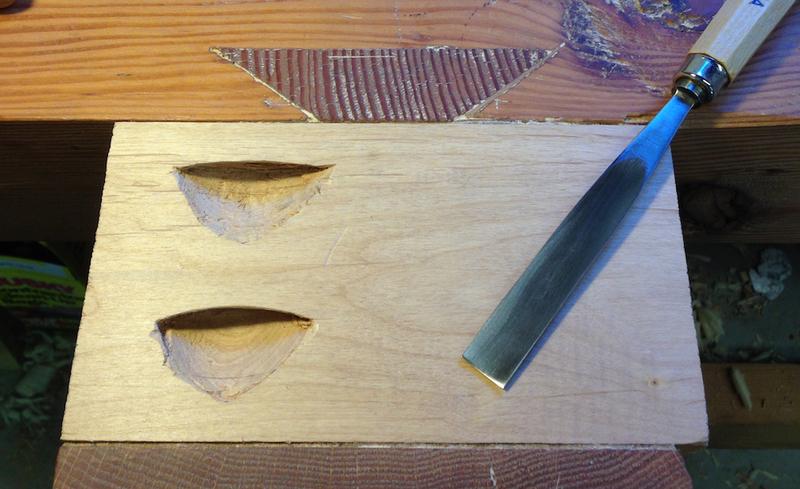 I cut both door faces and several 3″ wide strips for the edging — the doors are going to be 3″ deep. That will be plenty of room to hang all of my miscellaneous tools. That’s deep enough to hang my braces which I think are about the biggest (depth-wise). I think I’m going to put this all together with biscuits. I dug out my biscuit joiner, which I’ve used exactly once before, 12 years ago. I’ll make some practice joints to make sure I have everything set up properly. I should be able to knock these out pretty quickly tomorrow. The end is in sight! I added the guts to the saw till, nothing complex. I used a 1″ dowel to support the handle, it goes through one internal divider and fits into a pocket in the outside of the case. I made a little jig to get the holes lined up properly. 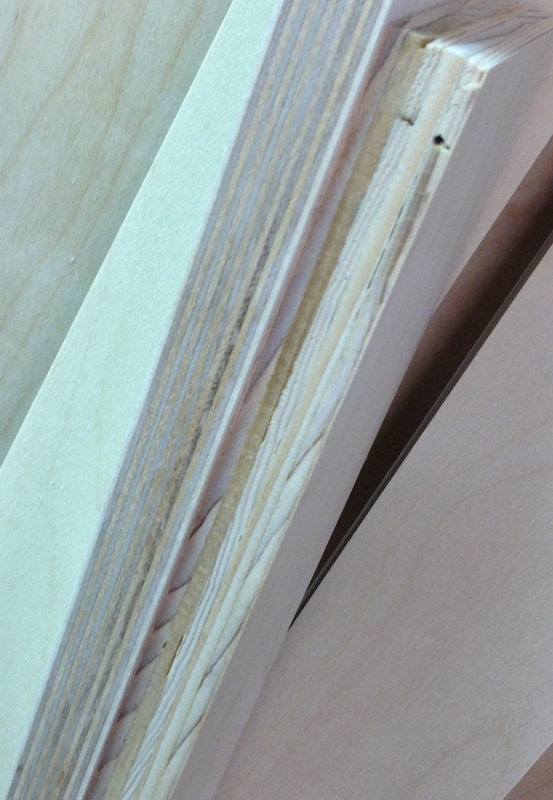 Then I cut some saw kerfs in strips of 3/4″ plywood on 1″ centers. I put three blade supports in, which covers all of my saws. I’ll have room for two or three more saws once I’m “moved in”. I’ll probably hang my dovetail saws on the doors, although they could fit here too.